CHANGES: Jo Butler (right) was sworn in for her three-year term on Borough Council by Mayor Mildred Trotman while Ms. Butlers husband assisted in the proceedings during the municipalitys annual reorganization meeting on Sunday. Former Council President Andrew Koontz urged the Borough to continue to maintain its parks before concluding his term on Council to join the Mercer County Board of Chosen Freeholders. Kevin Wilkes was appointed the new Council President by the mayor after a tied vote with David Goldfarb. Also that day, Chad Goerner was sworn in as mayor at Township Committees reorganization meeting. Sue Nemeth is the new Deputy Mayor. 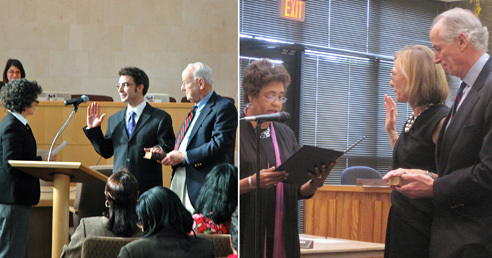 Mayor Mildred Trotman had to break two ties during Sundays Borough Council reorganization meeting. The first had to do with electing a new Council President after former President Andrew Koontz concluded his term with the Borough, while the second dealt with Council appointments to Borough Committees. Also during the session, Jo Butler and Roger Martindell were sworn in for three-year terms on Council. Chad Goerner and Sue Nemeth were sworn in as Mayor and Deputy Mayor at Township Committees reorganization meeting on Sunday, January 2. Mr. Goerner replaces Bernie Miller, who stepped down after serving a two-year term, and Ms. Nemeth takes Mr. Goerners place as deputy mayor. They were voted into office by their colleagues on Township Committee. Committee members Liz Lempert and Lance Liverman, who were re-elected in the general election last November, were also sworn in on Sunday. Area business owners and retailers have reported seeing a modest upturn in sales over the past year. While they are heartened by the consumer enthusiasm displayed over the holiday season, they remain cautious about the year ahead. The Joint Consolidation and Shared Services Study Commission expects a baseline report from its consultant, the Center for Governmental Research (CGR), by next Monday at the latest. The report will provide data and a preliminary analysis of the status of departments within the Borough and Township in terms of finances and operations and will be posted to cgr.org/princeton. We were finished when other communities were still plowing, said Princeton Townships Department of Public Works Superintendent Don R. Hansen reporting on the Christmas weekend snow storm at last Wednesdays Township Committee meeting. For the Princeton University womens basketball team, its trip to North Carolina last week turned out to be fraught with challenges.